Want something new and different for lunch, dinner or even breakfast? The spicy, unique flavor of Salvadorian chorizo will become a fast favorite in your house. It combines vinegar, paprika and garlic for out-of-this-world deliciousness. Get this zesty taste today from Premio Foods. Ingredients: Pork, Less than 2% of the following: Water, Salt, Paprika, Sugar, Vinegar Powder (maltodextrin, vinegar solids, modified corn starch), Potassium Chloride, Spices, Garlic Powder, Extractives of Paprika, Natural Flavors. You can go around the world without ever leaving your home when you bring home the exciting taste of chorizo. Our Salvadorian sausage gives you a glimpse of the dazzling flavors our neighbor to the south enjoys. This sausage can be found on the streets, in restaurants and in dishes that help define the national palate. 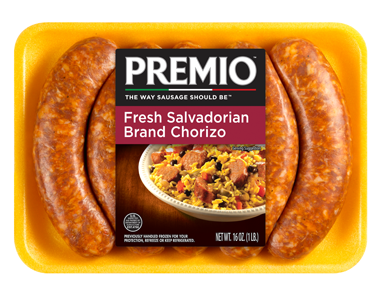 But you don’t have to go far to get it — Salvadorian chorizo is as close as the click of a mouse when you order from Premio Foods. That’s in addition to our Polish kielbasa and German bratwurst. Sample them on different nights, or bring them all together for an international extravaganza. Either way, you can find tasty recipes for all our varieties of sausage on our recipes page. Just type in the kind you want to use, and we’ll provide you with a list of dishes that are easy to make and won’t take much time in the kitchen. Offering our customers delicious recipes is just one way we look out for you. When we started Premio Foods more than 40 years ago, we made commitments to quality, customers, employees and community. We have kept those commitments for many decades by looking for ways we can help busy families navigate their daily lives. Providing recipes helps us honor that pledge and cuts down on the time you waste searching for a nutritious meal to serve your family. It’s a win-win in our book. You always want to come prepared to a party. That means bringing a truly unforgettable dish other guests talk about all afternoon. When you deliver a casserole, salad or dip made with our Salvadorian chorizo, you will find yourself overrun by fellow guests asking for the recipe. Direct them to our website to find it, and then tell us on social media what you liked so much about the dish and if you made any tweaks to it. We’re always eager to hear how creative our customers can be! You may find yourself bragging about the simple ingredients in our sausages, too. We refuse to put fillers in our Salvadorian chorizo or any other type of sausage. We put your health first by offering sausage that is naturally gluten-free and devoid of MSG. We carefully consider everything we add to our sausage, aiming for simple, fresh ingredients you can easily recognize. Our commitment to you doesn’t end with the food we make, though. We also carry that commitment through to our business practices. We have pursued a number of environmental initiatives because we believe it’s our duty to care for the planet. We reduced the amount of waste we produce while also improving our package practices to consume fewer raw materials. This makes for a cleaner earth and a better planet. We’re glad to be sharing it with you. We thank you for checking out Premio Foods and hope you enjoy your sausage.